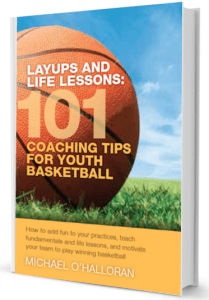 Layups and Life Lessons shows you how to add fun to your practices, teach fundamentals and life lessons, and motivate your team to play winning basketball. Nothing bores kids as much as waiting in a line. This one seems fairly obvious, but it’s amazing how many coaches don’t use all of the baskets available in the gym to them for certain activities. If the whole gym is available to you and it has 6 baskets, it’s a more valuable exercise to have players start at different spots on the court and do layups from basket to basket than to simply run line drills. In addition to conditioning, players get the chance to work on their dribbling and layup skills. For shooting drills, pair up players and have one shoot and one rebound at each basket. Same thing, when you’re working on one-on-one defensive drills. Use the whole court! Use all of the baskets! Good coaches view every practice as an opportunity to get to know their players better. Greet each player by name at every practice. Players need to have a comfort level with their coach and being able to converse with the coach will increase their comfort level. While some players will be talking as they enter the gym door, some players may need to be drawn out of their shells. Ask questions. Get everyone talking. Find out their interests and what motivates them. At pre-practice meetings, it’s helpful to ask questions and go around the horn and give each player the opportunity to talk. Also, approach players and chat some when they’re paired up at baskets for different drills. Some kids may be more comfortable talking in smaller groups than with the whole team present. Legendary college coach Don Meyer authored this phrase, “Shout praise and whisper criticism,” which is great advice for not only basketball coaches but also all people. One way to “shout praise,” with kids is to find players doing something right, and call attention to it for the whole team. If you look hard enough, over the course of several practices, you can call out of your players and ask them to demonstrate again their technique for the whole team’s benefit. Talk about a confidence booster for a player. I suspect more than a few players might go home and let their parents know that the coach thought I blocked out well for rebounding, or whatever the call out skill was. A different approach should be taken when critiquing. Talk individually to the player in a lower tone and suggest some improvements. The sandwich compliment is a great approach when you need to highlight an opportunity for a player. For example, if a player is standing up too straight when rebounding, and you want to let them know to get down low in a more athletic positions; here’s what you do. Start with a compliment: “You’re really good at protecting the ball when you get a rebound. Then, offer the critique opportunity: “I think it will really help you if you can get lower, in a more athletic stance, when you’re first starting to box out.” And then, finish with a compliment: “What makes you so effective as a rebounder is your heart and hustle. You never give up.” Compliment – Critique opportunity – Compliment is an effective combination. Use it. If kids just hear negatives, they get down on themselves. This combination is a proven winner. Most coaches teach plays for inbounding the ball underneath their offensive basket, and have structured plays for inbounding against a press after a made basket against their team. But not enough coaches practice sideline inbound plays. For the team with the ball, it can be a high-risk pass for the player throwing it in. A stolen pass can mean an unguarded lay-up for the opposing team. Well-constructed sideline inbound plays can put the defensive team on the defensive, and at a minimum, reduce the risk of turnovers. Teach players how to steal the basketball. For many teams, especially at younger ages, some of the best open looks players will get at the basket will come as a result of defense. Teach your players how to steal off the dribble, including which angle to take and how to tip the ball without fouling. Also, teach them to anticipate passing angles. A dominating defensive player can wreak havoc on the opposition. The Wizard of Westwood, John Wooden, was a strong advocate of ending all of your practices on a high note. The logic is sound: a strong finish has your players wanting to come back for more. Pity the coaches who end all practices with conditioning drills. Does that make players anxious to come back for more at the next practice? Here’s the trick for ending practices on high notes. Figure out the drills or activities that your team really enjoys – these are typically the ones that when you’re beginning to transition to the next drill; you hear some groans and comments like, “Can we do this longer?” When you’ve identified something your team really likes to do, don’t be afraid to come back to it often and at the end of practices. There are some old favorites like a game of Lightning or a 3-point contest that you can also turn to. Even if some of the early parts of practice were challenging, at least players leave with smiles on their faces. My use of a whistle at practices has evolved over time. When I first started coaching, I went to a coaching clinic where the coaching expert suggested heavy use of a whistle as a way of getting players’ attention and transitioning from one activity to the next. And so, I start mimicking that approach. But, in the last few years, I’ve found that I really only pull out the whistle when we’re scrimmaging. Why the reduced use of the whistle? It’s been my experience that kids respond better to conversational volumes vs. yelling and loud whistles. When I have the group together, frequently it works better to talk softer to force players to really listen, rather than to try to talk really loud. Now, during the course of a practice, I’ll call all of the players together frequently. When we come together to review the next exercise or go over a teaching point, we’re grouped tightly before dispersing to different baskets. By having everyone come in tightly, a coach doesn’t have to yell as much to communicate. Nothing replaces the whistle for effective stoppages during scrimmages. But, as I found, that may be the only time you really need to use it.